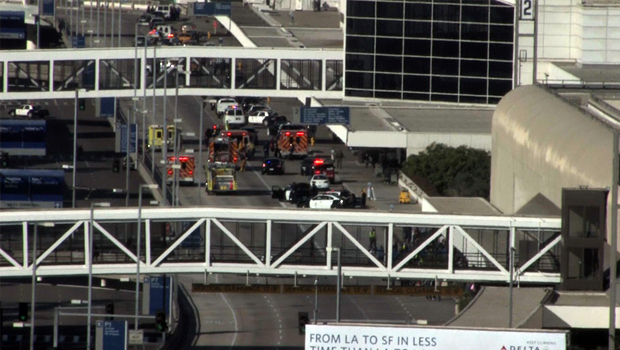 (CBS) LOS ANGELES - A gunman walked up to a TSA checkpoint at Terminal 3 at Los Angeles International Airport before being screened and opened fire, shooting a TSA officer, a law enforcement source tells CBS News' Pat Milton. Law enforcement sources told CBS News that one TSA officer is dead, and other TSA officers were wounded. Despite earlier reports that the shooter may have been an off-duty TSA officer, a federal official tells CBS News the shooter was not a current or former TSA employee. One shooter is in custody and was apparently wounded. CBS News has been told the gunman was an off-duty TSA officer. A law enforcement source told CBS News' John Miller that a gunman was wearing camouflage battle dress uniform. Law enforcement sources say there is no confirmation of a second shooter. A large box of ammunition has been found at the scene, according to a law enforcement official. LAPD Bomb Squad is reportedly on the scene trying to clear suspicious packages. Passenger Robert Perez told the station that TSA officers came through the terminal and yelled that a man had a gun. There is an FAA ground stop in place for flights bound for LAX.